Toylogic Inc. | Toylog - In Xbox 360 and Xbox One Happy Wars "What mankind has been waiting for! Item Design Contest Round 2" is on! In Xbox 360 and Xbox One Happy Wars "What mankind has been waiting for! Item Design Contest Round 2" is on! As a Thanksgiving campaign for Happy Wars, "What mankind has been waiting for! Item Design Contest Round 2" is coming to Xbox 360 and Xbox One! 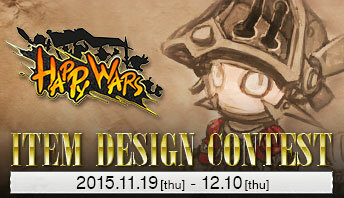 The winners of the context will receive the set they designed, a buff of their choice and a Happy Wars T-shirt! Check the Official Happy Wars site for details.